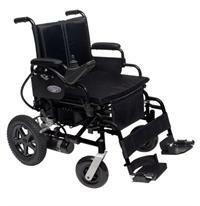 Elevated leg lifts are available for the Metro Power III transportable power wheelchair. A legrest which can be elevated placing the leg in an extended (knee straight) position. Most have some type of calf pad which may be padded or hard. Footplate and calf pad can be readjusted for improved alignment and placement. Some have an articulating feature which allows the legrest to be extended and become longer as the rest is elevated. This item is most commonly ordered for edema (swelling) control.Maintains the leg in an extended position. This works well for those users who have limited knee flexion (knee is fixed in a straight position), or for those who require this position post operatively. On a chair with a powered recline system, powered elevating legrests are useful in helping a user obtain a supine (laying on back) or reclined position independently. The ability to change leg position is sometimes helpful in resolving discomfort or pain issues in the lower extremities.